Our total Super KD clothing is 100 % made in Germany. With our clothing production in Germany we stand for the survival and development/expansion for Germany as a location for industry. We are against production in low-wage countries, dumping wages and the exploitation of manpower/labours. We are offering high quality clothing made in Germany, and our loyal customers from all over the world, appreciating our service, motivate us year on year, to keep on producing in Germany. Wth this Set Offer we will give you the wig shown for FREE and you save Euro 149.90 ! Pure luxury for all lovers of transformation ! Make your dreams come true with this highest quality female silicone full mask with attached breast torso of the extra luxury class! The mask and the breast torso are as 1 piece designed, so a perfect blending from the mask over the neck to the breasts. Turn into a " real " woman within only some seconds with this deluxe highest quality realistic female full mask with the attached breast torso made of highest quality silicone rubber (medical grade) which is absolutely safe to use and feels like a second skin. This full mask with breast torso looks and feels so soft and real, just arousing ! 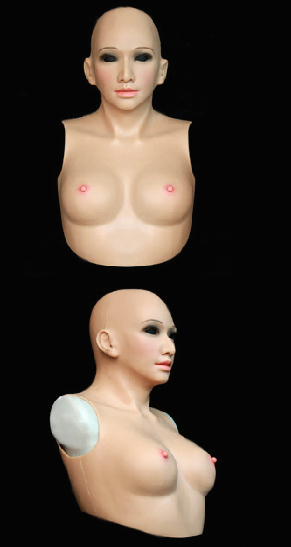 With this silicone mask with attached breast torso even facial movements are possible, just like a real woman looks like ! Feels so real just fantastic ! and with a wonderful permanent detailed realistic make up. But of course you could also put your personal make up on the mask. Additional options can be chosen. There are nose, ears and mouth openings. This wonderful realistic silicone mask with attached breast torso of the extra luxury class you will enjoy for years ! You will be the eye catcher on every party. There is a sizing chart below just have a look below or just click the small photos on the bottom. Although the mask with attached breast torso has a certain flexibility, please measure your size accordingly for the best fitting result. Baby Powder can be used for easy put on and to maintain the smooth surface but please take care of the eye lashes and make up. For cleaning please take off all accessories such as the rope ( if ordering the mask laced up). You could use mild soap for the inside , please do not rub the mask with attached breast torso rudely, after cleaning just air drying. For storage please do not fold or put any weight on it. You will enjoy this super deluxe mask with attached breast torso of the extra high quality class for years ! Material: Silicone Rubber (medical grade). we are happy to help, you are always welcome ! The sizing chart measures are in the measure unit ´cm´. just divide it with 2.54, so for example 5 cm is 1.97 inch. *the Price are inkl. VAT(19%) and plus with shipping costs.